I have made friends all over the city of Las Vegas. 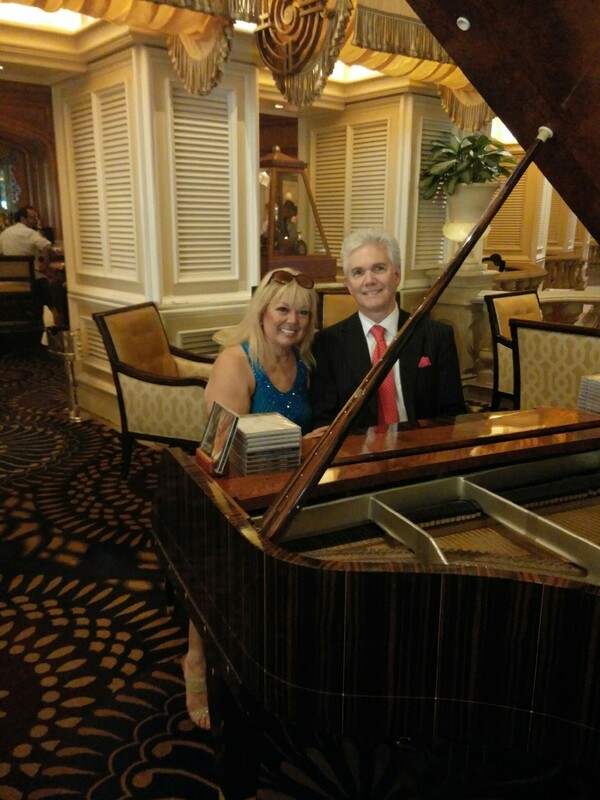 This is my friend, Whitney, a classical pianist at the beautiful Bellagio. The fact is, Las Vegas is the only city in the world that abounds with so much talent in one place…from musicians, to dancers to acrobatics, comedians and, of course, top-rated, rock bands and celebrity entertainers…think Imagine Dragon, Celine Dion, J Lo, Elton John, Paul McCartney, Bob Anderson (who does an impression of Frank Sinatra you will never forget). 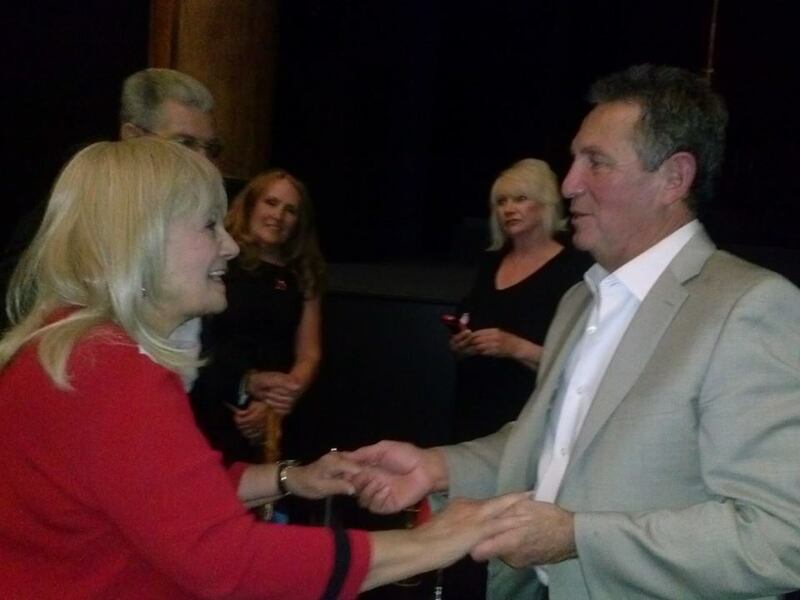 Here I stand with the indomitable Bob Anderson, Frank Sinatra show, who got every mannerism spot-on, then he schmoozed with the VIPs for a sec. LOVED IT. How do you let them know how much you appreciate their talent? Introduce yourself. Tell them how much you enjoyed their show. You don’t have to be a Lady to stand out to them. You just need to let them know just how much you appreciate their talent. Just do it. Categories: Las Vegas Experiences, News Updates | Tags: Bob Anderson, Introduce Yourself, Lady Brooks, Las Vegas experiences, The Frank Sinatra Show | Permalink. The “Top of the World” restaurant sits high above the Las Vegas Strip and is one of the few revolving restaurants in the world. It is a MUST experience if you only have one fancy dinner planned for your trip. Dinner for two, including one glass of wine each, a salad (shared) and a side vegetable (shared) to accompany your entre. $160, plus tip. When a gentleman makes a reservation at a fine restaurant he is likely doing it with the intention of making the evening special for his date, whether it’s his wife, his first date with a new girl, or a special occasion. He is also making reservations with many, many other men who have the same goal in mind, so how is he to stand out so he receives exactly what he wants? Rule #1 – Regardless of your age, never make the reservation or present yourself to the Hostess using your first name. That’s right. Present yourself as, for example, “Mr. Davis”, and state your preference…”I would like an intimate table for two on the window at 8 tonight”. You have, in this way, differentiated yourself as a gentleman of stature who wants the very best. Rule #2 – What is “Mr. Davis” to do when he is escorted by the Hostess to a non-window seat with a bright (not intimate) light glaring down on his table? Simply turn around and tell the Hostess “This won’t do. We’ll wait for _________” (fill in the blank). Though there may be a slew of others standing in wait for their reservation to be fulfilled, stand properly and wait. Standing in her face will NOT assure that the very next table will be presented to you. Assuming you are spending a great deal of your hard-earned money on this special dinner, don’t compromise. Exampled, the above situation with him not following those two rules. Dinner at the Top of the World, atop the Stratosphere in Las Vegas. He uses his first name, which never seems appropriate for a man in his sixties. Reservation under the name “Gary” (that will get him a lot of respect). When escorted to the table he proceeds to sit down, whereupon she says she doesn’t like the table and would rather wait. He follows the Hostess out and she hands him a small “table is ready” buzzer and he goes to sit down. What if they had taken the assigned table? She would have missed the whole reason they’re there…the view…he would have lost his romantic edge…and she would have looked harsh in the bright light. And, how long do you imagine he sat there in his very unimpressive, passive position? Forty-two minutes. 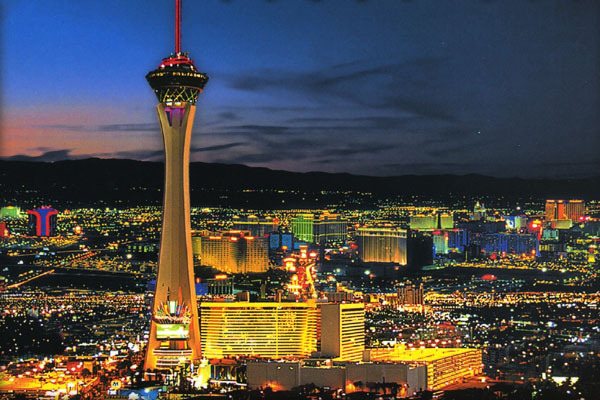 Categories: Las Vegas Experiences, News Updates | Tags: "Top of the World" Las Vegas, How to Get a Good Table, How to make a reservation, Lady Brooks, Lady Brooks blog, Las Vegas experiences, Luxury Las Vegas, Stratosphere Top of the World | Permalink. 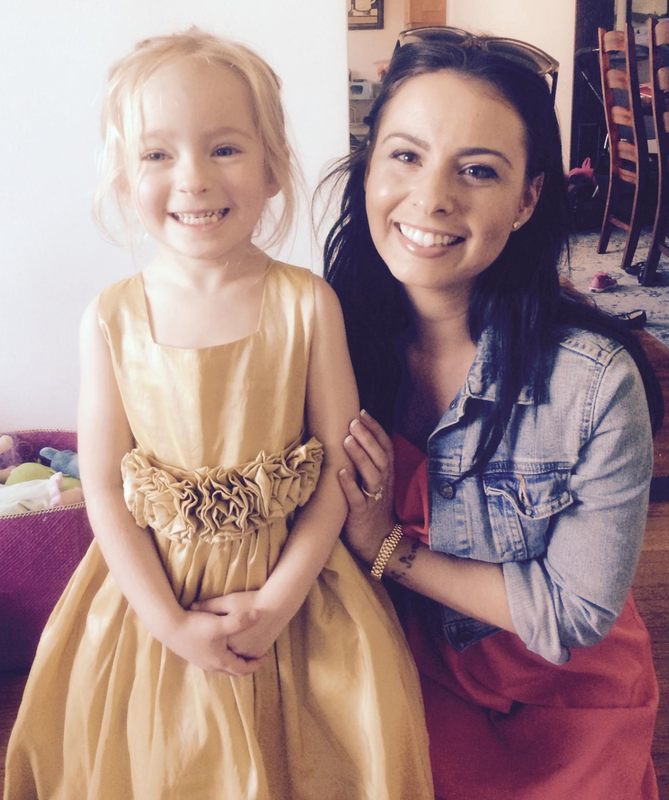 Pictured above is my middle daughter, Shelby Kathryn, who is just days away from her wedding, and Penny, her littlest flower girl wearing her flower girl dress. Shelby’s colors are ivory and gold and the little flower girl dresses are just so cute, aren’t they? In traditional European weddings, the bride is surrounded by a bevy of little girls, as opposed to the American wedding, where brides are accompanied by best friends and sisters. An example is pictured below…Kate Moss’ wedding party. Shelby Kathryn is going this traditional European route. My 4’11’ Shelby, size 00, will be just a tad taller than her girls. Penny is adorable, isn’t she? But what made me cry is my daughter with Penny. She’s all grown up. Gone is the little girl who spent hours in the gardens with her Great Dane companion who picked rose petals for a living when she was a toddler. Gone are the days I got to have her and hold her. If you have a daughter, enjoy her. Embrace all that she is. Each and every daughter is beautiful to her mother, and she should be. The picture made me cry because I am a mother of a daughter and she is going through one of life’s passages. What made me cry is to see her interaction with Penny and all the little girls Shelby Kathryn has managed to make feel beautiful and loved. 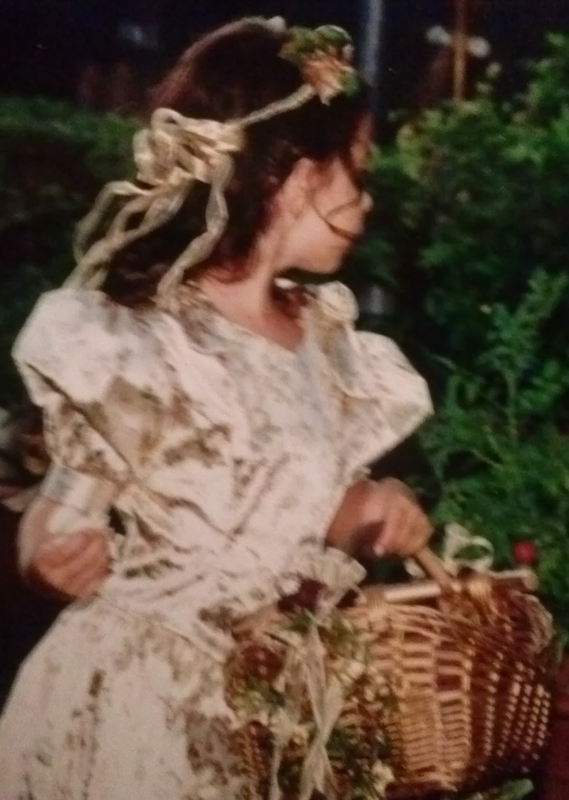 Mostly, this picture reminded me of Shelby’s first stint as a flower girl in my brother’s wedding so many years ago. Life is all about these experiences…helping them grow…watching them embrace every moment…and praying they’ve gained enough wisdom along the way to minimize their mistakes. Speaking of mistakes…Shelby has gone through 8 treatments to get that little wrist tattoo off her wrist. It didn’t work and she regrets having to wear the tattoo in her wedding. Ironically, the tattoo is the biblical “I am my beloved’s and my beloved is mine”…she just had it put on for a previous beloved. Oops. You’ve just gotta love them. Categories: News Updates | Permalink. 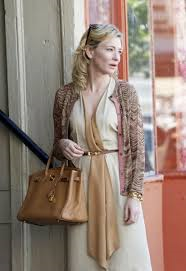 When the movie Blue Jasmine first came out, we just loved the costuming, especially Cate Blanchett’s character for which she just won the Academy Award for Best Actress, as Jasmine. 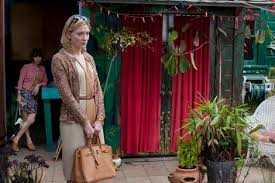 Not only did we think it was a brilliant movie, but Jasmine was dressed so exquisitely, from the camel Hermes Birkin bag, to the Chanel jacket and necklace, Cate pulled it all off so well. 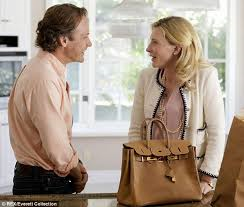 In nearly every scene her Birkin played a role and the popularity of the camel Hermes Birkin bag has soared as a result. 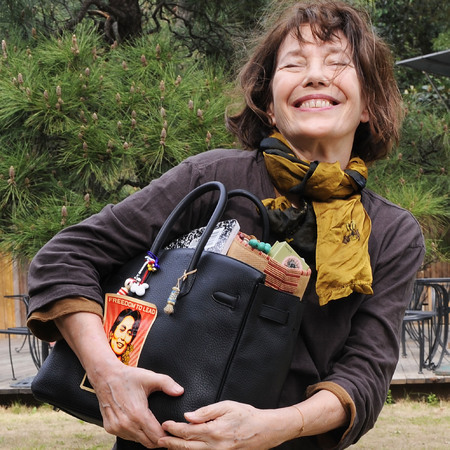 We have written numerous posts about our celebrity friends who carry their Birkin’s well, including Jane Birkin, herself. Look at Jane! and some who haven’t done such a good job, like Kim Kardashian’s new Birkin baby bag which we think was taken a little too far. We love the Hermes Birkin bag. We’ve just added a new category called “Birkin” in the blog so you can see who you know that’s carrying a Birkin around town. We saw this tee-shirt and thought “hmmmm…that’s one way to attract a monied man”…right? Actually, we think if a brand new Hermes Birkin bag isn’t in the budget, the second-hand market for Birkins is an excellent way to go. Birkin bags hold their value, but be careful…you want to buy a used Birkin from a reliable and knowledgeable source. We have heard that JaneFinds is the best place to go to score a gently-used Birkin that some woman likely sold to gather cash. Her loss, you gain? That’s where I’d go first. Categories: Birkin, News Updates | Tags: Blue Jasmine handbag, Cate Blanchett Birkin, Cate Blanchett's handbag in Blue Jasmine, Hermes Birkin bag, Jane Birkin, Lady Brooks | Permalink. Whilst the rest of the world yaks about the cost of the White House hosting a state dinner (approximately $500K), I glee in looking at the table service. For nearly 100 years the State table service has been provided by the American china manufacturer, Lenox. Lenox has created the state china since the Woodrow Wilson era. 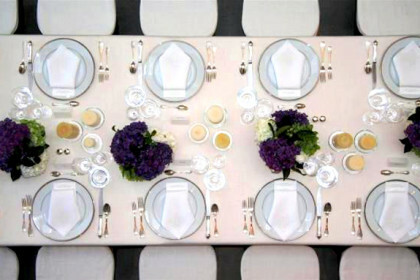 To see the table services for each president, click here to go to the Lenox White House page, where they have a lovely display of the settings. What we like is the current public sentiment to employ American manufacturers. The British Royals have always used UK manufacturers for their product needs, scarcely, if ever, buying anything made outside of the country and we need to see more of this done here in the US. For every $38,000 spent on an American-made product, another full-time employee is put to work, with benefits. Categories: News Updates | Tags: Lenox, Lenox White House, table service, White House | Permalink.